If you are experiencing pain, weakness, or numbness in your arms, or pain in your neck, you may be suffering from a herniated disc or bone spurs on your cervical vertebrae. These issues can often be treated with a cervical disc replacement at our Barrow Brain and Spine Scottsdale or Phoenix, AZ-area practice. Dr. Luis M. Tumialán, an experienced spine surgeon, can evaluate your candidacy and discuss the benefits of this treatment option with you. For the right patients, the surgical procedure can restore comfort, mobility, and overall quality of life. The discs between the vertebrae in your spine are an essential part of your anatomy. These structures help facilitate a wide range of motion, while absorbing shock and compression during daily activities. An injured or damaged disc can lead to serious pain and other issues. Discs can become herniated, leading to issues with vertebrae positioning and improperly distributed stress and compression. Bone spurs and general degeneration of the disc can also limit the room available for the nerve roots between the vertebrae, leading to pain, numbness, and weakness in the arms. Often, patients with a herniated or degenerated disc can receive non-surgical treatment, such as physical therapy or injection therapy, to manage their symptoms. However, in some cases, refractory to exhaustive nonoperative measures, decompression of the cervical nerve roots and spinal cord may become necessary. It is in those circumstances where fusion of the vertebrae may become necessary. Since 2006, the Food and Drug Administration has approved the use of artificial discs and for certain patients, an artificial cervical disc may be an option instead of cervical fusion. There are a wide range of artificial disc types and designs available to meet the varied need of patients. 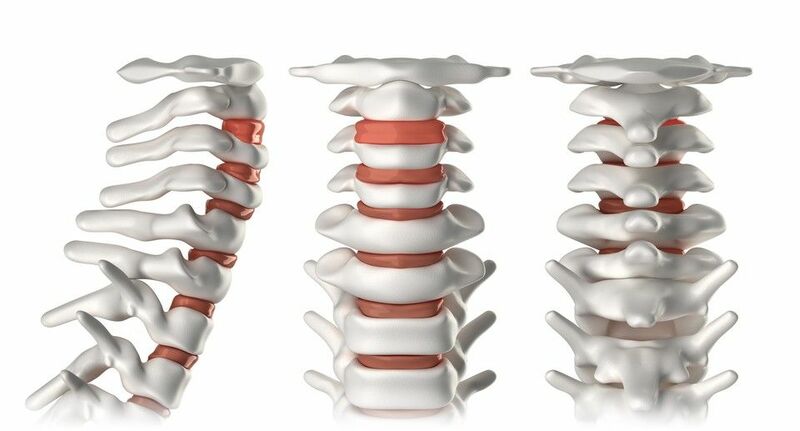 Typically, you will receive a replacement for a damaged disc between the C4 and C7 vertebrae. Dr. Tumialán can meet with you to discuss the best options for your health. Our practice specializes in using the most minimally invasive procedures possible, and we focus on working effectively and efficiently to ensure your safety. We will always strive to have you under anesthesia for as little time as possible, while ensuring your complete comfort. Our practice specializes in using the most minimally invasive procedures possible. We focus on working effectively and efficiently to ensure your safety. During the procedure, an incision smaller than an inch will be made in the front of the neck. Dr. Tumialán will then carefully separate and move the underlying muscles and tissue to reach the vertebrae. He may only remove part of the natural disc, or may remove the entire structure. Once the degenerative disc has been removed, he will reposition the bones to their proper spacing and height. This will allow Dr. Tumialán to insert the artificial disc using advanced x-ray technology to ensure proper placement. Patients typically only spend one in the hospital before returning home with minimal restrictions to your activity level. Some patients go home the same day. Unlike anterior cervical discectomy and fusion (ACDF) procedures, disc replacement does not remove the old disc and replace it with a piece of bone that fuses the two vertebrae together. Instead, the artificial disc can help maintain range of motion while still providing necessary support and stability for the neck. This process can lower the amount of stress placed on the fused bones, reduce the amount of hardware used, minimize the risk of related complications, eliminate issues with bone grafts and decrease the risk of subsequent surgery. In addition, this procedure can still significantly improve your quality of life, reducing pain, numbness, and other issues caused by compressed nerves and damaged cervical discs. There is no need to let pain and limited mobility affect your life anymore. Dr. Tumialán is recognized for the superior level of care and results he is able to provide patients, and he has the tools to restore your health. Contact our office today for an appointment.